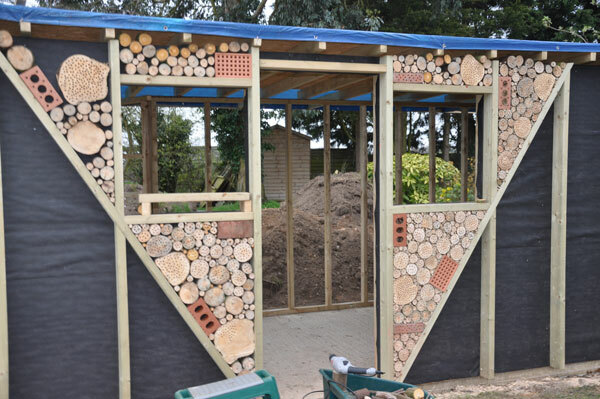 I found a link to this on Twitter yesterday, follow us on @bug_hotel by the way, it's a link to an awesome design for bug hotels built into walls of a new structure. Here's a photo, if you don't want to open the link. As you can see, the idea is to integrate bug hotels into the walls of the structure. Not only does this give a massive area for creatures to make a home in, it also looks great!! The different sized logs work really well. I'm not suggesting that we should all build our houses like this, but think about ways in which you could incorporate a bug hotel into a structure in your garden. The shed is the most obvious place, whether you've got an existing one and you add something on the outside, or whether you building a new one and incorporate into your design. Either way, have bugs in mind when you're next building in the garden and reap the rewards of something that will look great but also give a helping hand to those important bugs in your garden.